Epic $120 Billion, 1-Day Wipeout! One-hundred and twenty billion dollars is a lot of money. It’s roughly equal to the entire annual economic output of Kuwait — or Uruguay and Panama combined, if you prefer. It’s enough to buy 433,300 existing U.S. homes, even after median prices hit an all-time high of $276,900 in June. If the U.S. Navy scored that kind of windfall, it could buy nine of the newest, most technologically advanced Ford-class aircraft carriers — despite all the cost overruns that program has suffered. Feeling charitable? Then you could buy 16.2 billion Meals on Wheels for needy seniors with the money, given their average cost of $7.39. Or think of it this way: The largest Powerball jackpot in history was $1.59 billion in January 2016. Now imagine winning that prize 76 times over. Yep, that’s about $120 billion. And to think, one of this market’s most overhyped, overloved, overowned tech stocks — Facebook (FB, Rated “A-”) — lost almost that much in one day. Just 24 measly hours. If that doesn’t illustrate how out of control and dangerous this stock market and the “Everything Bubble” has become, I don’t know what will. 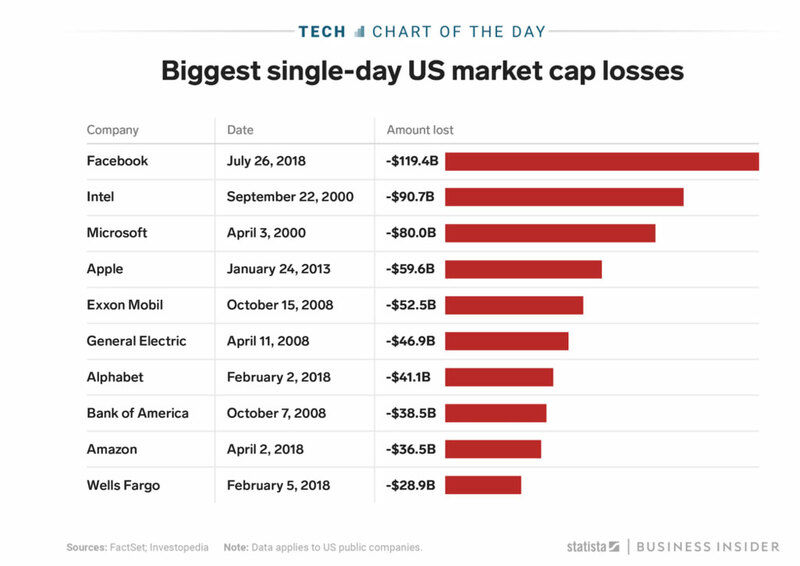 What prompted Facebook’s market cap meltdown? Warnings about slowing sales growth and a cooldown in user activity. But the cause of the collapse isn’t as important to me as the sheer magnitude of it. It was worse than anything seen during the dot-com bust. 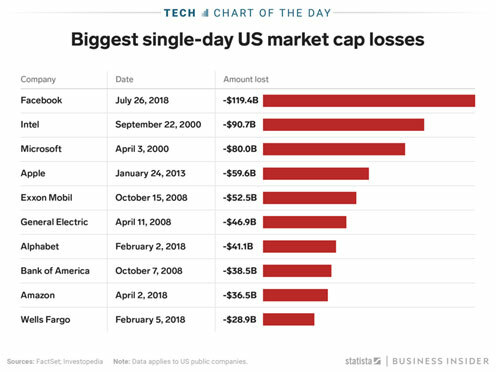 The “honor” in that collapse goes to Intel (INTC, Rated “A-”), which lost $90.7 billion in one day back in September 2000. It was worse than anything seen during the Great Financial Crisis. That “award” goes to ExxonMobil (XOM, Rated “C+”), thanks to its $52.5 billion, single-day loss in October 2008. So, we’re clearly talking about a shocking market event — and one that hasn’t been “contained” to Facebook-shares. Add in losses from the other so-called “FAANG” stocks — Apple (AAPL, Rated “B”), Amazon (AMZN, Rated “B”), Netflix (NFLX, Rated “C”), and Google parent Alphabet (GOOGL, Rated “C+”) — over a recent two-day period, and you get a whopping $185 billion plunge. There’s also a lot more carnage going on behind the scenes. Remember all those “garbage IPOs” I wrote about recently? The money-torching turkeys that investment banks have been foisting on public investors in recent months? Well, look at this table showing how a representative sample of them is performing. 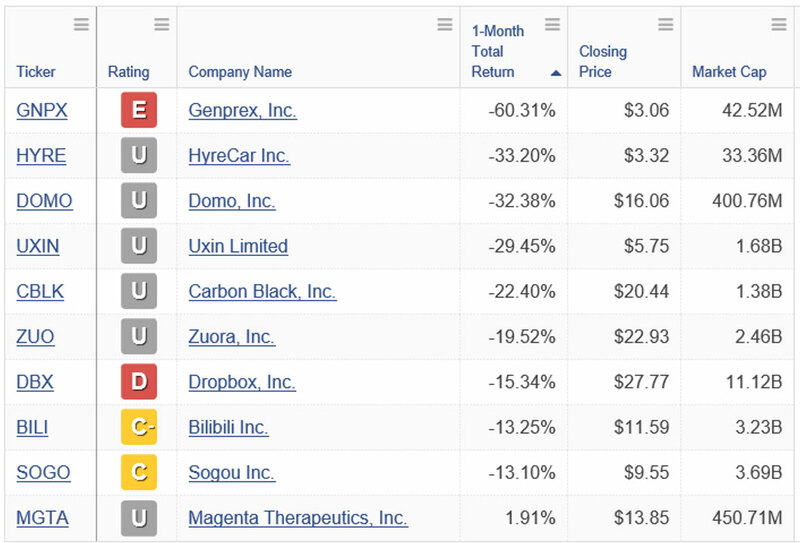 In just ONE MONTH, Genprex (GNPX, Rated “E”) has plunged more than 60%. HyreCar (HYRE, Unrated) has tanked more than 33%. 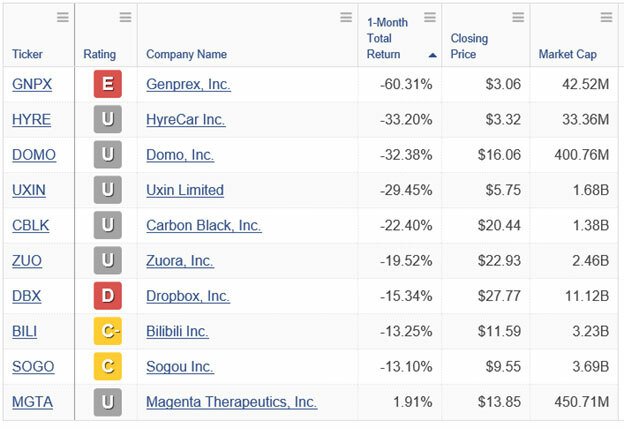 Domo (DOMO, Unrated) has dropped 32%, while Uxin (UXIN, Unrated) is down 29%. Now I want to make something clear. There are a lot of companies that are doing some pretty amazing things in the technology world. Many of them, including Facebook, sell products and services we all use in our daily lives. But that doesn’t mean their shares are always and forever good investments. Valuations matter. Sentiment matters. Price matters. And concentration risk matters. It’s a recipe for trouble. That’s why I warned you about the dangers of a few “sled dogs” pulling the entire market — literally days before Facebook and its cohort collapsed. And I hope as many investors as possible ... including you ... dodged that historic $120 billion bullet. As for the future, I’ll continue to hammer home the point I’ve been making throughout 2018: The character of the stock market changed in January. It’s quite possible we’ve seen “The Top” for this epic bull run. Even if that’s not the case, however, I believe you need to get much more conservative with your investment positioning. That means holding a much higher allocation to cash. It also means focusing on “Safe Money” stocks that offer attractive dividend yields, that operate in more conservative industries, and that aren’t overloved and overowned by hair-trigger speculators who will bolt at a moment’s notice. Those kinds of stocks are already starting to outperform the previous market darlings. And I believe this trend will continue throughout 2018 and beyond! P.S. I just gave you 10 stocks not to touch with a 10-foot pole. Now I want to share nine stocks with big, safe dividends — plus high Weiss "Buy" Ratings — you'll want to own instead. Click here to see this list.